15145.1 John 6 BIGELOW, son of John 5 ( John 4, John 3, Samuel 2, John 1) and Mary ( ___ ) BIGELOW was born 05 March 1774 at Goshen, Hampshire county, MA. At the age of twenty he left his home in Cummington, MA, and moved to Salem, NY, where he taught school for three years. In 1797 he married Lydia Benedict, daughter of Lewis and Jemima (Newman) Benedict. Later they moved to Broome, Schoharie County, NY, where they lived for 15 years, and where seven of their children were born. In 1815 John and Lydia packed their household goods and eight children into two Conestoga wagons. With three horses and two oxen they headed west. Stopping briefly at Buffalo, they loaded their entire outfit onto a boat--wagons, beasts, freight, and humans, and sailed for Ohio. They landed at Cleveland, which was at that time a very small village on Lake Erie. They lived for a year at what is now the corner of East Fourth and Euclid Avenue in the heart of Cleveland. They had a small plot of land which they farmed while looking for a place to make their permanent home. 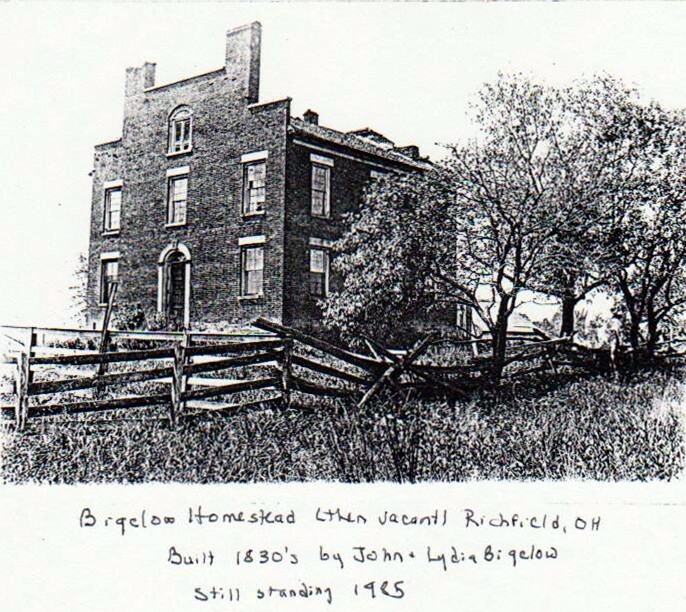 They occupied a log house already standing, which was later taken apart and moved to Richfield when they relocated to the land that John bought by paying off both the rightful owner and the occupant. John was elected the first clerk of Richfield township, Summit county, which was formed in 1816, an office he held for many years. John's original log house also served over the years as church, schoolhouse, town hall, social hall, and occasionally as jail. In 1830 John built a large house (see below), three stories high, with 14 rooms, eight fireplaces, and four staircases. His initials, J.B., are carved above the door. The third floor was originally used for spinning, weaving, and cheese-curing. While the property is no longer in Bigelow hands, it is now remodeled and in good condition, though the profile is somewhat altered and the front chimneys removed. John was a great advocate of freeing the slaves in the south. In his house one fireplace in the basement hides an entrance into a small room which is said to have been a hiding place for runaway slaves, and this was a station of the Underground Railroad, in hiding fugitives for their escape into Canada and freedom. Tradition says that a secret tunnel led from the Bigelow home to the next hiding place, but the present owner of the house has never found any evidence of its existence. Since John died twenty years before the Civil War, this help to the blacks probably was carried on by his family. Lydia, mother of 10, grandmother of 49, would never have allowed a fugitive, whether black or white, to go away hungry. We have a handwritten record that says John died in 1842 and Lydia in 1863. Howe's Bigelow genealogy varies in claiming John died in 1838 and Lydia in 1866. No headstone remains to identify in which cemetery they are buried. In addition to her own family, Lydia raised the three surviving children of her deceased daughter Elsy. Lydia frequently went to Cleveland and back by horse. One day her horse threw Lydia, crushing one leg so badly that amputation was necessary. She went through the operation without any anaesthesia, but the folded man-size handkerchief which she held clenched in her teeth was chewed to bits at the end of the ordeal. As soon as the stump of her leg healed, she placed it on the seat of a chair and soon resumed her household activities using the chair as a walker. The old chair that had been Lydia's walker is still owned by the family (1986). 15145.11t Elsy, b 1799 Salem, NY; d 1835 Parma, OH; m 16 Mar 1820 David Smith. 15145.12t Marlin, b 16 Oct 1800 Broome, Schoharie co, NY; d 1880 Richfield, Summit, OH; m (1) 01 Apr 1823 Mabel Sheldon; (2) Jane Simmons; (3) Ann Page; (4) Harriet Bolles. Res MO and OH. 13 children. 15145.13 Nancy, b 1802 ( headstone has 1812) Broome, NY; d 10 Dec 1839 Meriden, CT; m 16 Apr 1835 Almond Andrews; res Meriden, CT.
1514S.14t Mary Ann, b 15 Jan 1804 Broome, NY; d 1884 Richfield, OH; m 15 June 1825 Thomas E. Ellsworth. 5 children. 15145.15 Lydia, b 1806 Broome, NY; d 1891 Cleveland, OH; m (1) 01 Jan 1828 J.B. Denison, and (2) Thomas Palmer. 15145.16t Jemima Minerva, b 1808 Broome, OH; d 1891 Cleveland, OH; m 09 Feb 1825 David Stoffer. 1 son. 15145.17t John, b 1810 Broome, NY; d 1885 Cleveland, OH; m ca 1831 Philena Humphrey; res Parma and Cleveland, OH. 5 children. 15145.18t Washington, b ___ 1814 Broome, OH; d 02 Apr 1853 Richfield, OH; m (1) 21 Dec 1837 Harriet Oviatt; m (2) 04 Oct 1842 Nancy Huntley; Res Richfield, Summit co, OH. 5 children. 15145.19t Ann Jenette, b 1816 Richfield, OH; d 1868 MI; m Joseph Mace. 2 daughters. 15145.1A Susan, b _ Feb 1819 Richfield, OH; d ____ Tucson, AZ; m Horace Pomeroy. correspondence with many family descendants.